As many of you know, I'm a big fan not only of brown bagging it for lunch, but coming up with impromptu lunches based on whatever ingredients I may happen to have in my bag. See, because I don't have a car and travel on light rail, I try to keep a canvas tote of basic food staples in the break room fridge. It's much easier than having to lug around an extra bag of lunch back & forth everyday, and I can feel free to change my mind about what to enjoy that day. With time, my coworkers have gotten used to my lunchtime adventures, going rather wild about some of them, especially my Garbanzo & Avocado Salad. This time around, they were both amused & impressed with the simple but flavorful lunch I came up with on the fly. My original plan was to make a quick lentil & veggie salad with the last few things I had in Pantry Bag. But upon further inspection of its contents, I came across a package of white corn tortillas. All of a sudden I wanted nothing more than a couple of carne asada tacos, the kind you get at those tiny taco trucks, filled with flavorful steak & topped with crisp onions & cool cilantro. Alas, I had no steak. But I did have the lentils, half a sweet red bell pepper, and my last can of the RoTel diced tomatoes & green chilies I'd scored for my video recipe. I figured they'd make a good meatless filling for some quick little tacos, and they were, indeed, quite delicious. 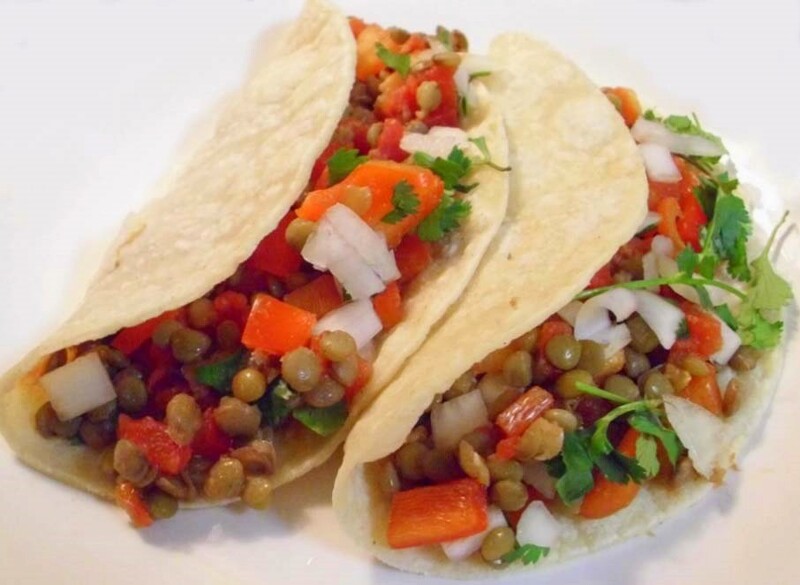 I love this recipe because out of just one cup of lentils & the veggies I had on hand, I was able to make enough filling for two days' worth of lunch for under $5! And even though the photo's not my all-time favorite (wretched office lighting! ), I think it still shows off how fresh & tasty these little tacos are. Combine the lentils, chopped pepper, diced tomatoes & chilies, salt & cumin in a bowl and mix together until well combined. Check for flavor & adjust according to taste. Heat the tortillas either on the stovetop or in the microwave and fill with generous amounts of the lentil & pepper mixture. Top with the diced onion & cilantro, roll 'em up, and enjoy! I've really been digging your blog. I always turn to the ethnic recipes when I'm looking to save a little dough on groceries. Like African, middle eastern, some Asian and Eastern European. Mmm, yummy! Love the creativity... and what a good idea about keeping some staples at work! I'm a big fan of "refridgerator" salads & burritos... basically any leftovers of pretty much anything can be turned into a salad or a burrito. For instance, I had a leftover pork chop, some rice, and a can of beans. Mix that with some cheddar cheese and salsa, wrap in a tortilla and there you have it. Or, cut up your leftover meat and roasted veggies, mix with lettuce and other salad stuff you like, and it's a gourmet salad.